Topic : Northern Rock Crisis: A strategic Analysis of the situation after the crisis. Organisations are internally structured groups located in a complex network of inter-group relations characterised by status, power with prestige differentials in the society (Hogg & Terry 2005:250). The society believes about an organisation, it customs, the self, the image of its members and the things and values that differentiate it from other organisation and make it what it is its cultures (Fincham & Rhodes, 2005). Black, R.J.,(2003) define organizational culture, as the attitudes, experiences, beliefs and values norms shared by people and groups in an organization and that control the way they interact with the outside organization. Strategic positioning is concerned with the impact on strategy of the external environment, an organisation�s strategic capability (resources and competences) and the expectations and the influence of stakeholders (JSW 2005, Mintzberg et al., 2003, Grant 2002). To almost anyone you turn to, strategy is a course of action, it is a plan or a way of doing things unique to a particular organisation or identical to other organisations. It is some sort of consciously intended guidelines to deal with a situation (Mintzberg et al.2003, Cheng & Bolon 1993, Birkinshaw2000, Grant 2002, Lynch 2000) In management, however �strategy is a unified, comprehensive, and integrated plan�.designed to ensure that the basic objectives of the enterprise are achieved� (Mintzberg H. et al 2003:4). 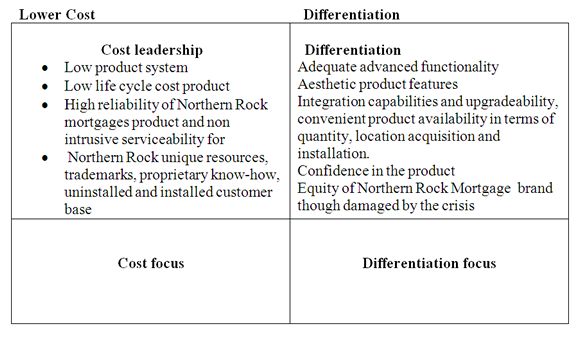 In analyzing the strategic position of Northern Rock with respect to the environment, I have used Porter�s five forces framework the PESTEL model, the SWOT analysis tools, and the core competencies. The Financial industry in the UK is still very attractive and has opportunities for synergistic gains. The main players in this market include: Lioyds TSB, Barclays, Citibank and a host of others. Being a perfect market competition is fierce and with customer having a low switching cost. All the major players offer identical services to the public (consumer, investment and insurance). Competition also comes from retails supermarket, insurance companies and other financial houses. Suppliers include network technicians. Competencies provide a means of looking at those behaviours that differentiate the �best from the rest� and a common language for talking about critical on-the-job behaviours (JSW2005). The entire business requires direct interaction with the customers, and it is because of the quality service that the company is able to serve million customers a year and that is why before the crisis the company was able to have sold mortgages worth a record �10.7bn in the first half of 2007, up 47% on the same period a year before. This is equivalent to 19% of all new mortgage policies sold over that time, making it the market leader in the UK (BBC 24/09/07). The management of Northern Rock needs to consider the present organisation paradigm of the organisation. Organisational paradigm according to Johnson & Scholes (1997) are those set of assumptions, beliefs which are rarely talked about, which are not considered problematic and most often managers in an organisation are unlikely to be explicit about it. It reflects the collective experience without which members of an organisation would have to do things their own way in different situations they face (Johnson 1992, Johnson & Scholes 1997). These assumptions are more commonly observed in conversations, discussions between the different stakeholders in an organisation (Dwyer & Kemp 2000). In some situations assumptions are deeply embedded in an organisation and its� members that it can only be manifested through peoples action (Dwyer & Kemp 2000). In all, these assumptions, ways of doing things are the backbone of the organisation (Johnson 1992, Johnson & Scholes 1997). Johnson & Scholes (1997) contend that, using the organisation paradigm a new cultural environment can be created. This is so because, by looking at the cultural web, you see what the organisation is like �now� and you mimic how you want it to be in future. The difference is the change the organisation intends to make. The same idea was supported by Dwyer & Kemp (2000) when the researchers argued that, most organisations only look at the paradigm during a change process. 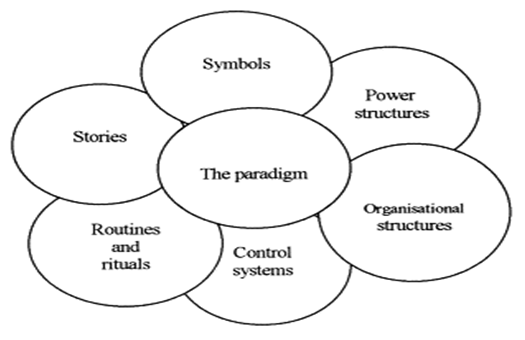 From the cultural web above, six major types of artifacts can be distinguished � rituals and routines, stories, symbols, power structures, organisational structures and control systems (Johnson & Scholes 1997). These artifacts are the wider aspect of an organisation that give a clue of the paradigm, reinforces the assumption behind the paradigm and represent those organisational aspect taken for granted (Johnson & Scholes 1997, Dwyer & Kemp 2000, Johnson 1992). For example, according to Dwyer & Kemp (2000), symbols in an organisation are words, objects, emblem, logos etc. Organisational stories are narrative focus on a single unified sequence of events, they are use to influence other peoples understanding of events. Power structures are the different managerial level through which sequence of events are passed and observed while the control system indicates what is important to monitor, focus attention and resources upon (Dwyer & Kemp 2000). As a notion for understanding an organisational success Peter & Waterman (1982) suggested a psychological theory of the link between organisational culture and performance. In their argument culture is seen as a reward to work. Because employees, the heroes, villains, those performing the organisational rites and rituals sacrifice much for the organisation, culture is therefore a sort of return for effort. In addition, Fincham & Rhodes (2005), Wilkins, & Patterson, (1985), and Seel (2000) see organisational culture as a powerful attraction, a lever for change and a backbone for innovation. This should lay the foundation for the strategic change program outlined below for Northern Rock. In discussing Tesco competitive advantage, I have analyzed it with respect to Porters competitive advantage framework. Considering the strategic capabilities of Tesco, Tesco competitive advantage will be analysed with respect to its strength. This is based upon Porters argument that, a firms position itself by leveraging it strength. Looking at the overall strategy of Northern Rock, one will not hesitate to conclude that Northern Rock has a broad target. Here Northern Rock is able to bring its product faster to the market than some of the competitors. Thus the company is focused on cost leadership and differentiation. Northern Rock might be at the brink of bankruptcy but the situation is not all that bad. For what kills a bank is rumour. Despite all effort made at the level of the bank of England to bail Northern Rock out of the crisis, customers are still not comfortable. According to BBC news of 24.09.2007, �Funding problems at Northern Rock, the country's fifth largest mortgage lender, triggered the first run on a British bank in more than a century�. Despite all efforts made by leading experts with the help of the British government, a once market leader in the mortgage industry in United Kingdom (UK) shares promulgated by 32% in the City as worries about its future viability escalate. The situation of Northern Rock though is vulnerable, it provide an opportunity for opportunistic gains. Cummins & Xie (2007) contend that most M&As are often motivated by opportunistic and synergistic gains that follows the shareholders of the acquiring firm if subsequent managers succeed in accomplishing the pre-merger or acquisition objectives. Cummins & Xie (2007) went further to echo that if M&As are motivated by non-value-enhancing factors or if post-merger integration is unsuccessful, then the merger activity may lead to deteriorations in efficiency or productivity. However, such a rational is often implemented without considering the soft side of organisation resources (Intellectual capital). Social psychologist (e.g.Hogg & Terry 2001) have long argued that to ensure continuity of the new organisation resulting from the pre-merged groups, successfully integrating the acquiring and the target firm requires managing inter-group and interpersonal processes in a constructive and productive ways. Thus if external funding should be sorted out in the form of a buy out for the organisation. 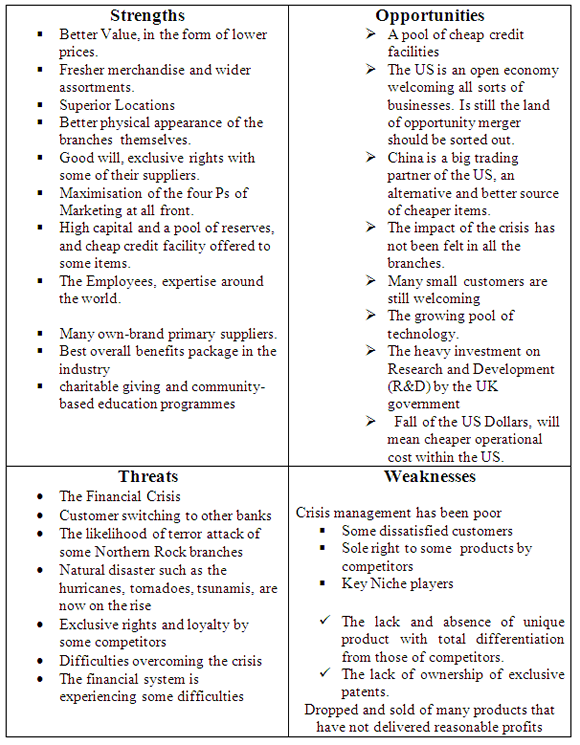 The present challenge for the management of Northern Rock now is to be able to change the perception of employees from the �us� versus �them� mentality to a collective �wee feeling� through re-categorisation of their activities before the crisis so as to ensure a sense of continuity to the public and the customers (Hogg & Terry 2001). Most researchers have argued that (e.g. Cummins & Xie 2007) firms with relatively high returns on equity, capital and larger market shares are more likely to be acquirers, while those with low return on equity and financially vulnerable firms are more likely to be targets. Northern Rock now is a target and the government should assist it merge with a foreign bank or investors from another continent preferably the United States. From the analysis made above, one will see that the corporate image of Northern Rock, proprietary know how, staff, relationship with it customers and suppliers represent key areas and the key success factors for the organisation now. Unlike the manufacturing industry where product advantage has been found to be the most important factor in determining the competitive position of a firm in the industry, the case of a bank is different. The competitors in the former industry can easily replicate the important elements of a firm�s new service (Storey & Easingwood 1998). It is against this backdrop that Tesco�s managers inorder find the key to new service success must look to factors other than sustainable product advantage (Storey & Easingwood 1998). Storey and Easingwood (1998) assert that the totality of the service offering must be understood from the perspective of the customer. Thus, I will recommend Northern Rock to pay greater attention on this. The ASO model is made up of three elements which include: the service product; the service augmentation; and marketing support (Storey & Easingwood 1998). Northern Rock should reinforce, incorporate and carry these three models out together in order for its product to meet the overall expectations of the customer. 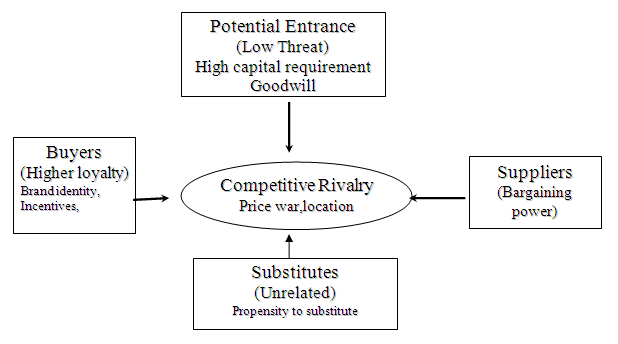 The impact of the service product on competitive advantage is determined by five factors which include: product quality which is measured by the reliability, accuracy and consistency of the product, product distinctiveness, perceived risk, physical evidence and product adaptability (Storey & Easingwood 1998). The impact of service augmentation is determined by distribution strength, effective communication, staff/customer interaction and customer experience while the impact of marketing support is determined by marketing knowledge, staff training and skills, investment in systems and the launch strategy (JSW 2005). The more unique and distinct the product is the more attractive it will be to customers and thus the higher will be the competitive advantage of the firm in the industry. Perceived risk measures customers� expectations on how the product will meet their needs, that is, whether the product will perform above or below expectations. The higher the perceived risk, the lower will be the customer�s purchase intentions and thus the competitiveness of the product. If customers perceive a lower risk, the higher will be their purchase intentions and thus the competitive advantage of the firm. Perceive risk is highly dependent on the reputation of the firm. A firm with a high reputation is likely to witness a low perceived risk than a firm with a low reputation. The firm must therefore try to maintain a high reputation so that its products will not be perceived as high risk products by consumers. The management of Northern Rock must be able to maintain this within it strategic fit. The higher the accessibility the higher will be the customer base and thus the competitive advantage of the firm. Effective communication plays an important role in that it explains the product as well as positions the company and the product. Staff/customer interaction is a measure of service quality as opposed to product quality (. As well as assessing the quality of the service product, customers also tend to evaluate how the service was delivered by the staff. The customers look in particular at the welcoming nature of the staff, their physical appearance or outlook, consciousness, promptness and efficiency . As far as experience is concerned, customers tend to purchase from a firm were they have had a positive experience with. It is therefore important for a firm to try to provide the customer with the best service product and service quality during its first interaction with the customer. By so doing, the firm can be sure that it will retain such a customer and can always be sure that the customer will return in future. In Northern Rock value is created to credit facilities, mortgage loans etc. The organisation needs to recapitalize on this now. Organisational culture is apparently symbolical, unifying, and holistic which provides a sense of focus and directions to both individuals and subgroup. Organisational culture appeals and promotes the image of an organisation, the perception from the environment and the community as a place of interest. It span management thinking, champion innovative ideas in an organisation and at an individual employee level, renounce organisational culture facilitate easily the integration process of a new recruit as the perception of �I� feelings and mentality is easily change into a collective �We�. The financial industry and mortgage industry in the UK in particular and the world at large still remain attractive for earning good profits. Though the present situation of Northern Rock is not well suited for this market it can still earn usually good profits. The opportunities abound. Through merger and acquisition a turn around strategy could be sorted out. Given the existing market potentials, the previous position enjoyed by the company its strategic capabilities (knowledge expertise, existing facilities granted, and relationship with suppliers through strategic alliance the company can effectively break through. The firm must therefore try to maintain a high reputation so that its products will not be perceived as high risk products by consumer pay all customers deposits once requested, even caution customers by offering credits to show they are viable. Blocher E., Chen K. Gary C., Lin T. (2005). Cost Management A Strategic Emphasis. Third Edition. McGraw-Hill. Bowlby, R. (2001). Carried Away: The Invention of Modern Shopping. Columbia University Press. Cummins et al., (1999) Consolidation and efficiency in the US life insurance industry, Journal of Banking and Finance 23 (1999), pp. 325�357. Cummins D.& Xie X., (2005) The united states insurance market: Characteristics and trends,. Efficiency and scale economies in the US property-liability insurance industry. Working paper, University of Pennsylvania, Philadelphia. Hogg, M., Terry, D. & White, K. (1995). A tale of two theories: A critical comparison of identity theory with social identity theory. Social Psychology Quarterly, 58, 255-269. Johnson, G., (1992). Managing strategic change: strategy, culture and action. Long Range Planning 25 1, pp. 28�36.